Diolch i chi am eich croeso y bore yma. Thank you for your welcome this morning. This special morning as you begin your 60th anniversary celebrations. Yesterday, of course, was St. David’s Day and I have to confess that I am not Welsh I’m English but I did live in Wales for over ten years before moving to the United States. In Wales, my home parish for much of the time was St. David’s in the diocese of Bangor, and so I do feel a special connection with you this morning. I also appreciate that you have even arranged a little bit of Welsh weather this morning. I almost feel at home. Sixty years old, sixty years young. During the last sixty years much has changed. Recently I asked Phil Loveless to tell me a little about the history of the parish and how it is has changed. He told me that this beautiful building was not the original building. The parish started in a wooden structure that was filled with pews that were made by the first parishioners. He also told me of how fire destroyed that building in 1991, a fire that ultimately led to this sanctuary being built. The church building that we stand in today has changed as has the church that we belong to and the world that we live in. Bay Park is no longer a new hosing estate, Eisenhower is no longer the President, women are no longer barred from becoming priests in our church. Times have indeed changed and I am sure will continue to change in the future. Change is central to our readings today. In our Old Testament lesson from Exodus, we see Moses leading the Israelites out of slavery in Egypt into the wilderness and towards the Promised Land. It was a journey that would take many years. It was a journey that would change the Israelites forever. God called Moses to the top of Mount Sinai to receive the laws and the commandments that would hold this wandering nation together in the wilderness, as they learnt what it meant to have just one God that would care for all of their needs. God called them to movement, God called them to change, God was present and His unconditional love was the glue that held a nation together throughout all of that change. Then in our Gospel reading we have Matthew’s account of the Transfiguration. It is no coincidence that we have this reading today on the last Sunday before the start of Lent. In the chapter before the reading we heard this morning Jesus predicts for the first time the Passion Story. For the first time Jesus tells the disciples that he must go to Jerusalem and undergo great suffering at the hands of the elders and chief priests and scribes, and He starts to teach them that He must be killed so that on the third day He can be risen from the dead. And so when Peter acknowledges Jesus as the Messiah, he is also acknowledging him as the suffering son of the Living God. Matthew is telling us that change must come to transform the suffering into the joy of eternal life through the resurrected Christ. Now I don’t know about you but if I was Peter that would be a lot to comprehend and take in. He acknowledges that Jesus is the Messiah and the next thing that Jesus does is start predicting and teaching about suffering and how he must die and then be raised to life from death. In the midst of all of this Jesus uses the transfiguration to strengthen Peter, and James and John. He takes them up a mountain. Symbolically to a place between heaven and earth. Then He is transfigured before them. His face shines, His appearance changes. Moses and Elijah, the great leader and the great prophet appear and talk with Jesus. To Peter, a Jew, the appearance of these two great figures cemented his belief that Jesus truly was the messiah and confirmed Jesus’ authority. But hold on. Through human eyes and human understanding this scene would have been impossible for Peter to comprehend. What was happening before his eyes? How could he, or James or John explain how the appearance of a person standing in front of them suddenly changed, where did this bright light come from, for that matter where did these other two figures come from. People don’t just appear at the top of a mountain. But Peter, James and John had more than just human eyes and human understanding. They had faith. Faith that in God, anything and everything is possible. If the transfiguration and the appearance of Moses and Elijah were not enough to completely convince Peter of who Jesus really was God himself directly intervenes and says to Peter, James and John. “This is my Son, the Beloved; with Him I am well pleased; listen to Him!” “listen to Him”. By now, those three disciples are shaking in their boots, they are on the ground, so what does Jesus do? He does what he always does best – he reaches out and touches them personally and reassures them, “Do not be afraid”. But there is no time to rest the journey towards Jerusalem and ultimately to the cross is about to begin. It is time to come down from the mountain and get moving. The journey continues, change must happen before the kingdom of God can become more complete. What does this mean to us today? What does it mean for you both as individuals and as a parish as you reflect and celebrate the last sixty years and look forward to the next sixty years? I hope that this next bit by now is no surprise. I’d like to suggest to you that Jesus is calling you to a ministry of movement and of change. Of course, some aspects of this is very obvious, you are in the process of discerning who your next rector will be. Change will happen. But I invite you to think in other ways to. If you were to take Jesus on an anniversary walk through the neighborhood today what would He see? As you walk with Him on the road that goes under interstate 5 and you pass a homeless brother or sister, would you walk on by? Or would you stop and invite them into a conversation with Jesus? If you invited Jesus to coffee hour here at St. David’s what would take His interest? Maybe He would sit and help sew one of the quilt squares that you make to send to support our troops serving overseas. Maybe if it were a Friday He would share a joke with people at the Gray Brigade. Maybe he would sit right over there and ask what more can we do to spread the gospel of Love. Maybe he would stand right here and say get a move on and go change the world. Go change the world. That is a tall order. But change does not always have to be something big. 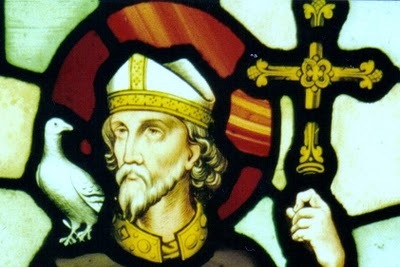 St. David achieved a great deal in his life. He is remembered a spiritual leader who founded a monastic tradition and established many communities and churches. He inspired a nation. History records that on the Sunday before St. David died he preached a sermon. In that sermon he said “Be joyful, and keep your faith and your creed, and do the little things that you have seen me do and heard about”. “Do the little things”. One of my lasting memories of my time in Wales is centered on St. David’s Day. There is a road, a dual carriageway that stretches from Chester in the north to Caergybi / Holyhead in the west. The road hugs the north wales coastline for most of its length and is one of the most beautiful drives in the world. But just when you think that the drive cannot get any more scenic or beautiful a change happens. It happens once a year at the start of spring. It is happening now, it always happens around St. David’s Day. The center divide between the carriageways is full of daffodils and almost overnight what was once just a green stem burst into an oasis of color – from bud into full bloom. As you drive down the road all you see for miles upon miles are thousands of beautiful yellow flowers. A simple act of spring results in an amazing change. And that is exactly the model that we can us for the mission work of the church. Simple small acts can affect change which can lead to amazing results. But just like the transfiguration and Peter. If we rely only on human eyes and human understanding then the work of Christ, the mission work of the church can seem daunting, frightening and even beyond understanding. We must always put our faith in Christ. We must constantly strive to hear God’s voice as we discern what he is calling us to do in the world. We must reach out our hands to Jesus so that we can let him guide our way. As you move into your next sixty years I pray that you will continue your movement in spreading of Christ’s Gospel of love and justice. As individuals, as a parish and as part of the worldwide church. I pray that you will hold St. David close to your hearts and in the little things that you do, change for good, will come about. The Good News is, that even when that movement and change may seem scary or uncertain that God will be with you just as he was for Moses and Peter. Journey with Jesus. “Be joyful, and keep your faith and your creed, and do the little things that you have seen me do and heard about”.